At Salem Plastic Products, we are proud of the comprehensive line of standard display products we offer, but also realize that your unique situation may need a custom solution. Our capabilities in custom applications go well beyond most companies in our industry. Salem Plastic Products is capable of a full range of custom die cutting and related operations. Our equipment and processes are easily adaptable to custom items—either variations on our existing styles or entirely new ones. 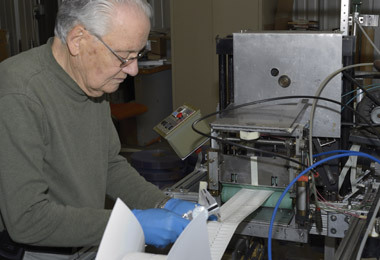 Much of our ability to deliver quality die-cut parts, fast, and at great prices is predicated upon our proprietary equipment we have developed in-house over many years. We can do the things we do largely because we have equipment no one else has! You can view our case studies where we worked with customers to find solutions to solve their unique problems. 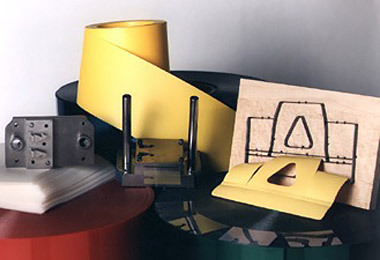 Contact us today to let Salem Plastic Products us help you with your unique needs. Typical die-cutting operations require large steel rule dies with multiple parts on the same die surface. This is pressed, with substantial force onto the material from which the parts will be made. But there are several drawbacks to this procedure. First, the dies themselves are very expensive. Second, the pressure required to cut the material causes the die to dull more quickly, requiring its replacement or resharpening. Third, the material waste tends to be greater. Finally, this methodology tends to be more labor-intensive and require more time to produce a volume of parts. Our "in-line" approach allows the use of a single steel rule die which can be made very economically—usually hundreds of dollars less than its larger cousins. Are there limitations to what we can create? Sure. But much depends on the width and length of the part along with the material being die-cut. Please contact us and let us help you with your unique requirements. From the moment you do business with us, you will realize the difference. You can view our case studies page where you can see how we worked with customers to find custom solutions for their unique needs. Below you is a summary of our services. We stock PVC polyethylene and polypropylene sheet in many colors and thicknesses. Contact us for samples. We can also provide most of the services you see listed here on foamed plastic and rubber, cork, thin-gauge metals and similar materials. Slitting—Rolls up to 30" wide and 40" diameter. Slit from 1" to 30". Rewinding—Narrow roll widths are our specialty. 40" master roll diameter rewound from 3.01" to 30" O.D. Sheeting—Sheet sizes from 1" X 1" to 24" X 96". Perforating—In-line perforating from roll stock. Creasing—In-line creasing from roll stock or sheet stock. Adhesive Backing—Pressure sensitive and heat activated adhesives available.